Where did the four MIAA state champions end up in our final statewide Top 25? 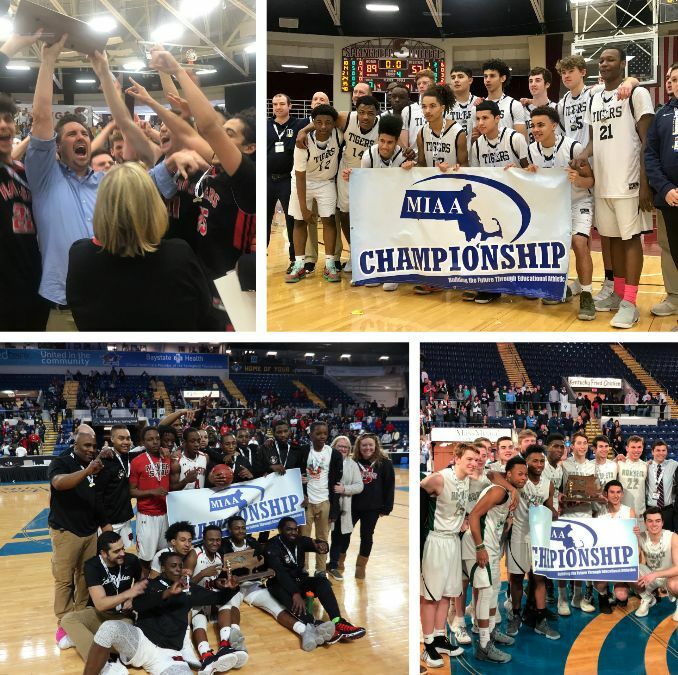 Our final rankings of the best boys' hoops teams in Massachusetts, as selected by our team of editors and correspondents. 1. Mansfield (26-2; Last Poll - 4) The Hornets played flawlessly the state tournament, never trailing in the second half en route to their first D1 state championship in program history. 2. TechBoston (25-1; Last Poll - 7) The Bears’ athleticism, speed, and full court pressure were too much to handle for the rest of the field as, behind Walter Dew-Hollis and Maurice Works, TechBoston claimed the Division 2 state title. 3. Everett (23-2; Last Poll - 2) Crimson Tide claimed their first sectional championship since 1994 before falling to Mansfield in the Division 1 state semifinal. 4. Franklin (22-3; Last Poll - 6) For the second consecutive year, Franklin put together a terrific season, once again reaching the state final. Paul Mahon will be tough to replace, but Chris Edgehill and Jalen Samuels should have this team contending again in 2019. 5. Springfield Central (22-1; Last Poll – 1) The Golden Eagles’ promising season ended in sudden fashion against Franklin in the Division 1 state semifinals. Junior center Hason Ward can be expected to keep Central towards the top once again next season. 6. Lawrence (21-3; Last Poll - 10) Terrific season for the Lancers, who came up just short of a sectional title, falling to Everett at the Tsongas Center. 7. Brockton (20-4; Last Poll - 12) An impressive run for the Boxers, as they added on to a 17-3 regular season with trip to the D1 South final. 8. Lowell (18-5; Last Poll - 12) There are not many bigger shoes to fill than the ones that Alex Rivera is leaving behind after a monster senior season in Lowell. 9. Needham (19-4; Last Poll - 8) Despite being unable to repeat as South sectional champions, the Rockets put up another 17-win regular season. Needham will certainly miss star Thomas Shaughnessy, but sophomore Will Dorion is one to watch next season. 10. Newton North (18-5; Last Poll – 9) Tigers will be left wondering how far they could’ve gone had Chris Matthews been healthy all season. Ethan Wright departs as the second-highest scorer in Newton North history. 11. Watertown (19-7; Last Poll – NR) Behind star John Korte, the Raiders turned on the jets in the postseason, defeating St. Mary’s in the sectional final before knocking off Burke and Easthampton to claim the Division 3 championship. 12. Burke (19-1; Last Poll - 11) Head coach Sean Ryan and star guard Levar Williams took the Bulldogs to heights not seen in nearly two decades, as Burke took home a sectional title for the first time since 1998. 14. Catholic Memorial (16-5; Last Poll – 5) The Knights seemed destined for a prolonged playoff run, but fell victim to a red-hot Bridgewater-Raynham team in the opening round. 15. Cambridge (21-3; Last Poll - 15) The two time-defending champions were knocked out by Lawrence in the Division 1 North quarterinals, but still finished with a solid 21-3 overall record. Khai Smith looks to be a star in the making. 16. North Andover (19-6; Last Poll – NR) In a crowded Division 2 North field, it was the Scarlet Knights who emerged, defeating defending champion Brighton in overtime before knocking off Woburn to reach the state-semis. 17. Bridgewater-Raynham (15-7; Last Poll – NR) The Trojans finished the regular season on fire, and then proceeded to knock off Division 1 South favorite Catholic Memorial on the road in the opening round. 18. Belmont (17-6; Last Poll – 17) Belmont looked well on its way to claiming a Division 2 North title before a stunning end to its clash with Woburn ended its season. With Danny Yardemian back in the fold next season, the Marauders will be in contention for a Middlesex League title. 19. Hingham (21-3; Last Poll – NR) The Harbormen put themselves on the map this season reaching the sectional final for the first time in program history. Forward John Lowther and shooting guard John Gates will both return next season, so this should be just the beginning for Hingham. 20. Apponequet (22-1; Last Poll – NR) Apponequet suffered its only loss of the season in the Division 3 South sectional final, falling to Burke. 21. Woburn (16-8; Last Poll – NR) The Tanners entered the Division 2 North tournament as the number eight seed, but went on a Cinderella run, knocking of top-seeded Beverly and fourth-seeded Belmont to reach the sectional final. 22. Springfield Putnam (18-4; Last Poll – 24) After falling twice to Central in the regular season, the Beavers put up a valiant fight in the Division 1 West final, before ultimately succumbing to a second half comeback by the Golden Eagles. 23. Algonquin (16-8; Last Poll – NR) Back close to full strength, Algonquin made a run for the Division 1 Central title. Behind sharp shooter Kyle Henderson the Tomahawks knocked off second-seeded Wachusett and St. John’s (Shrewsbury) before falling to Franklin in a five-point game. 24. St. Mary’s (19-4; Last Poll – NR) Spartans suffered a surprise loss in the sectional final to eventual champion Watertown, but still battled through a tough schedule while taking home the Catholic Central League title. 25. Easthampton (19-6; Last Poll – NR) Ant Moynihan and Sopie Mek took Eagles’ fans on one exhilarating March ride before falling to Watertown in the program’s first state final appearance.